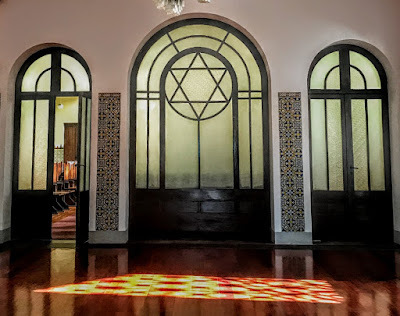 During my walking tour of Porto yesterday [5 February 2019], and my visit to the Kadoorie Synagogue in the suburbs, I heard the extraordinary story of Artur Carlos de Barros Basto (1887-1961), the former amry captain revived the Jewish community in Porto, overcoming many personal obstacles and a very public attempt to disgrace him. His life story has earned him the name of the ‘Captain Dreyfus of Portugal,’ recalling the disgraceful treatment of Captain Alfred Dreyfus i(1859-1935) in France. Artur Carlos de Barros Basto, also known by his Hebrew name Abraham Israel Ben-Rosh (אברהם ישראל בן-ראש‎), had a successful career both in the military and as a writer, and published several works on Judaism. 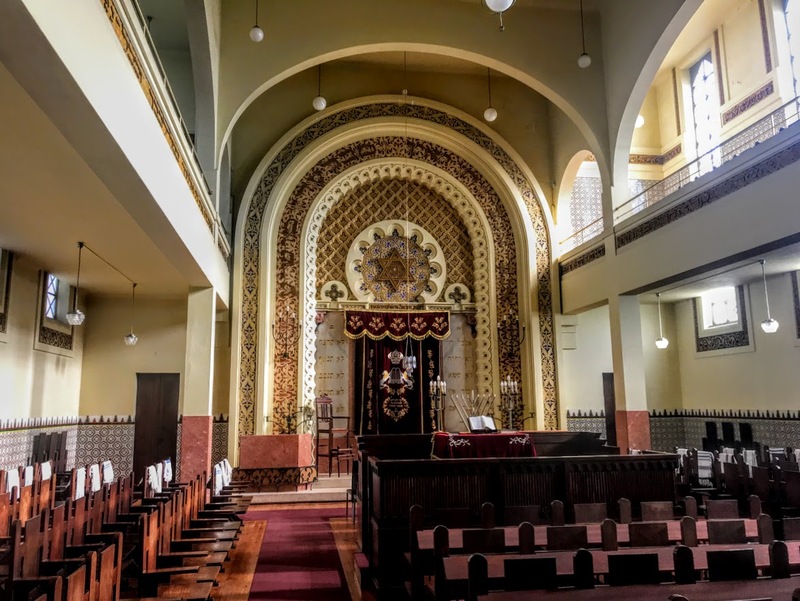 He was one of the key figures in re-establishing the Jewish Community in Porto and in building the Kadoorie Synagogue, the biggest synagogue in the Iberian Peninsula and one of the biggest synagogues in western Europe. He also helped the return of Crypto-Jews to Judaism and during World War II helped Jewish refugees escape the Holocaust. Artur Carlos de Barros Basto was born in Amarante in Portugal on 18 December 1887. When he was still young, his dying grandfather revealed to him that the family had Jewish ancestors, descended from Portuguese Jews who had been forced to convert to Christianity by the Inquisition in the late 15th or early 16th century. His family had not observed Jewish traditions and rites, and so he only became aware of the existence of Jews in Portugal in his late teens 1904. That year he read a newspaper report referring to the inauguration of the Shaaré Tikva synagogue in Lisbon. When he joined the army, the young Barros Basto was sent to Lisbon to take part in a course at the Escola Politécnica de Lisboa. There he visited the synagogue and asked to be admitted. The leaders of the synagogue refused to allow him to join, but Barros Basto was persistent and did not give up. When a Republic was declared in Portugal in 1910, Barros Bastos was one of the young army officers who raised the Republican flag in Porto. Soon after, as a lieutenant in the army during World War I, he commanded a battalion of the Portuguese Expeditionary Corps at the front in Flanders. For his bravery on the battlefield, he was decorated and promoted to the rank of captain. Barros Basto was self-taught, and after learning Hebrew he lived for a while in Morocco. There he began a formal process of conversion to Judaism (known in Hebrew as Giur). He was circumcised in Tangier, presented himself before a rabbinical court (Beit Din), and in a religious ceremony took the Jewish name of Abraham Israel Ben-Rosh. 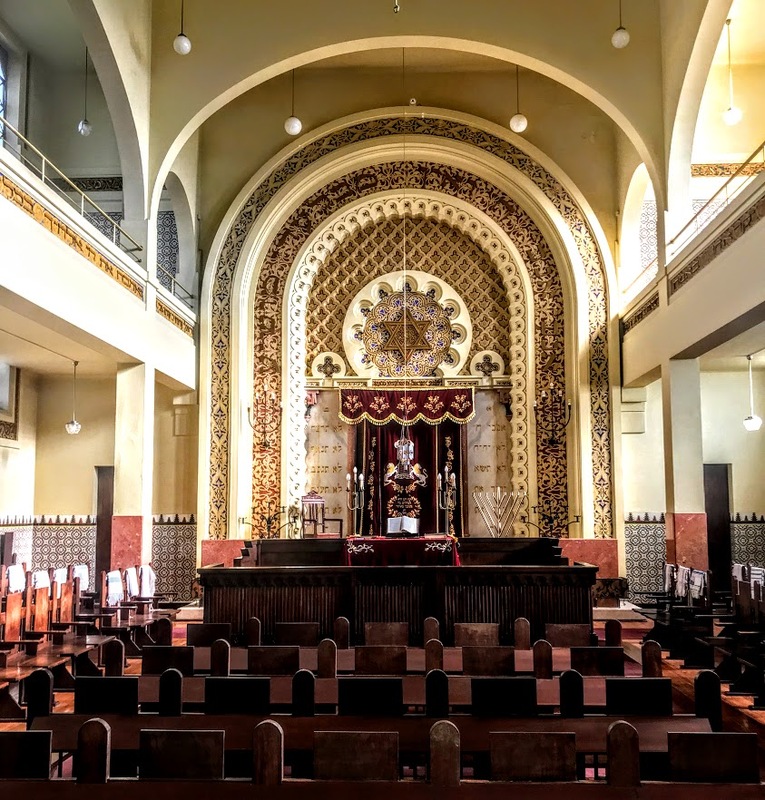 Barros Basto began to plan building a synagogue in Porto, and in 1923 he officially registered the Jewish Community of Porto and the Israelite Theological Centre in Porto. He also founded a Portuguese Jewish newspaper, Ha-Lapid. 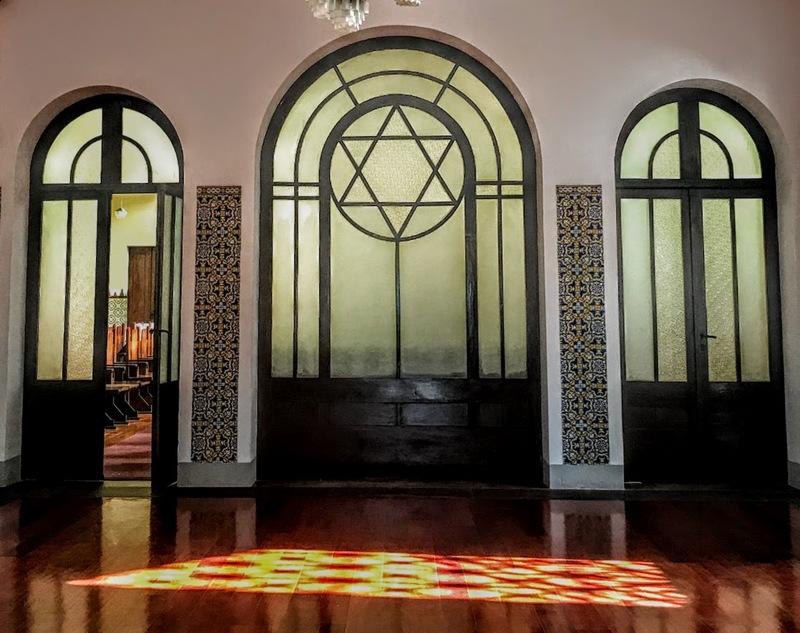 At first, the community rented a house on Elias Garcia street that began to function as a synagogue. As time went on, more and more people turned up in the synagogue, claiming they were the descendants of conversos or Jews who had been forced to convert to Christianity in the 15th and 16th centuries. They described how their families had secretly kept alive yet some Jewish practices and rituals in the secrecy of their homes. Now, these secret or crypto-Jews began to take part in public Jewish rituals and worship. Barros Basto started to visit villages and towns in the Trás os Montes and Beiras areas, searching out people interested in returning to Judaism. To support this mission, the Community of Portuguese Jews in London set up the Portuguese Marranos Committee to help people of Jewish descent to return to the Judaism of their ancestors. When the Salazar regime came to power in Portugal in the 1932, Barros Basto was identified with opposition. 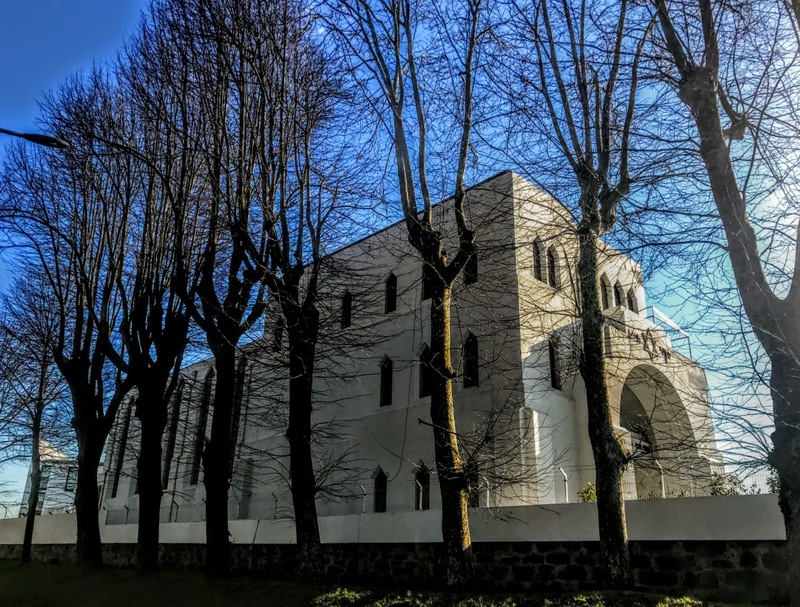 Life became increasingly uncomfortable for him as he was sent on placements in locations increasingly distant from Porto in move to forcibly distance him from the synagogue and Jewish community that was growing slowly but steadily. An army disciplinary board ruled against Barros Basto in 1937. He was dismissed from army and deprived of his commission for taking part in circumcision ceremonies, described as ‘immoral’ acts. A year later, the Kadoorie Synagogue was officially opened in in Porto in 1938. This had been his great project for almost a decade, and Barros Basto had collected the funding, bought the site and inaugurated the building project. This became the headquarters of the Jewish Community of Porto and still retains its religious functions. During World War II, Barros Basto helped hundreds of Jews to escape the war and flee the Holocaust, helping thousands of refugees to rebuild their lives, beginning with a fresh start in Porto. Barros Basto died on 8 March 1961 in Porto. In accordance with his wishes, he was buried in Amarante, the city where he was born. He was wearing the uniform with which he always served his country. On his deathbed he said that one day he would receive justice, but this did not come in 2012, over 50 years after his death. The name of Captain Barros Basto was officially and posthumously rehabilitated by the Portuguese State in 2012. His granddaughter, Isabel Ferreira Lopes, is now the Vice President of the Jewish Community of Oporto. He is also great-granduncle of the Portuguese-American actress Daniela Ruah. 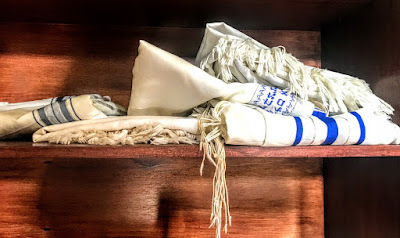 After a morning tour of Jewish Porto throughout Tuesday morning [5 February 2019], I spent part of Tuesday afternoon at the Kadoorie Mekor Haim Synagogue in the northern suburbs of Porto. This synagogue, built on the Rua Guerra Junqueiro from 1929, was inaugurated in 1938 and is the largest synagogue in the Iberian Peninsula and one of the largest synagogues in Europe. The story of this synagogue dates back almost a century to 1923, and to the efforts taken to re-establish the Jewish community in Porto by Captain Artur Barros Basto, a Sephardic Ben Anusim or descendant of a family that had been forced by the Inquisition to convert to Christianity around the 15th century. Captain Barros Basto returned to Judaism after he heard the family story from his father on his deathbed, and he would become, perhaps, the most important figures in the Portuguese Jewish community in the last century. He found at least 20 Ashkenazim Jews Porto, but because there was no synagogue in the city they needed to travel to Lisbon for all their religious matters. Artur Barros Basto began to plan a synagogue, and officially registering the local Jewish community with the local government in 1923 as the Comunidade Israelita do Porto or Israelite Community of Porto. At this stage, the nascent Jewish community used a house on the Rua Elias Garcia, and in 1927 he founded a Portuguese Jewish newspaper, Ha-Lapid. Barro Bastos raises funds to buy a plot of land, and 90 years ago, on 13 November 1929, he applied for legal permission to begin building work. The architects on the project were Artur de Almeida Júnior and Augusto dos Santos Malta, an architect trained in the Escola das Belas Artes de Porto. Rogério de Azevedo designed the interior, and may also have been involved in other work, including the woodwork in the library. 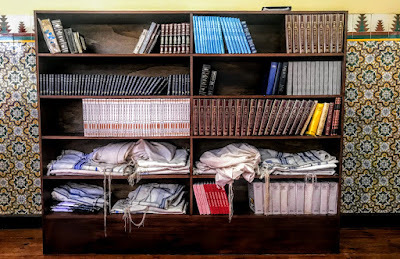 A Jewish theological institute began working in the building even before it was completed. Support came from the Committee for Spanish-Portuguese Jews in London, but the work continued slowly until 1937, when the synagogue was completed, thanks to the contributions from the Jewish community in London and with funds donated by the Kadoorie family and Iraqi Jews from Portugal. The Kadoorie family is originally a family of Mizrahi or ‘oriental’ Jews from Baghdad. From the mid-18th century, the family was based in Mumbai (then Bombay). Their family businesses were later based in Shanghai and then in Hong Kong. Sir Eleazar (‘Elly’) Kadoorie (1867-1944) was a prominent Jewish philanthropist and banker who died in a Japanese prisoner-of-war camp during World War II. His wife Laure Kadoorie (1866-1919) was descended from a family that had fled the Portuguese Inquisition. When she died, her children decided to honour her, and they donated generously towards completing the synagogue. It was later renamed Synagogue Kadoorie Mekor Haim. Meanwhile, Captain Artur Barros Basto was expelled from the Portuguese army for taking part in Jewish rites, including circumcisions. The synagogue was inaugurated in 1938. 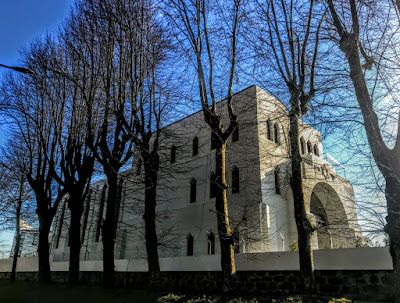 It was just a few meters from the German School, and the Portuguese authorities rapidly planted large trees the screen the School and the Synagogue from each other. 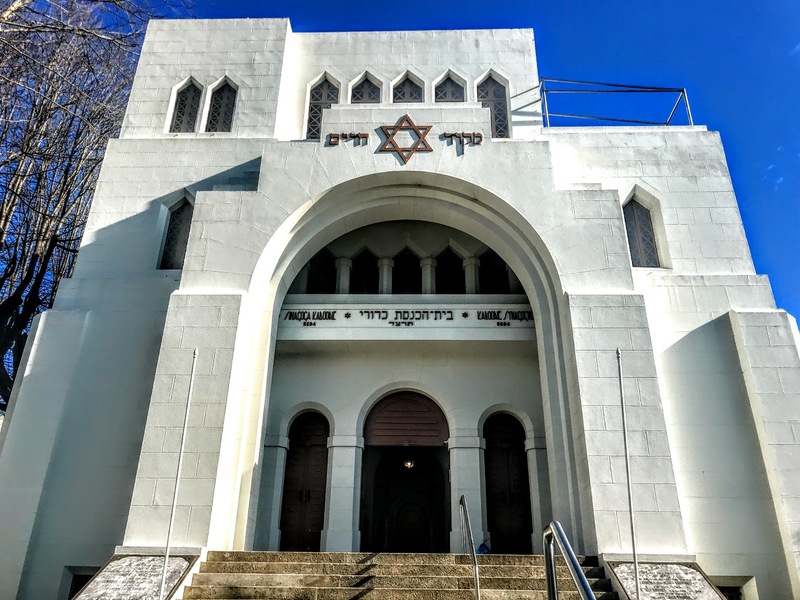 During World War II, hundreds of refugees fleeing the Holocaust passed through the doors of this synagogue on their way to safety in the US and many other places. Captain Barros Bastos died in 1961. Half a century later, the synagogue opened to the public in 2012, and the Jewish Museum of Porto opened in 2015. The building stands on the corner of Rua Guerra Junqueiro and Rua João Martins Branco, in the residential area of Campo Alegre. The synagogue is a rectangular structure, oriented west to east, with a tiled roof and cupola. Steps lead up to the west façade with its large arch and portico. 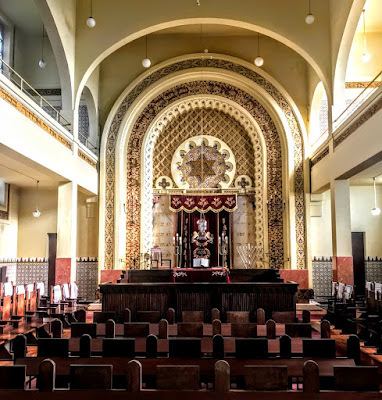 Inside, the main hall has a domed ceiling and a balcony It is decorated with Hebrew passages from the Torah and Moroccan-Sephardic decorations. Today, the community includes Jews from a variety of backgrounds, including Poland, Egypt, the US, India, Russia, Israel, Spain, Portugal and England. 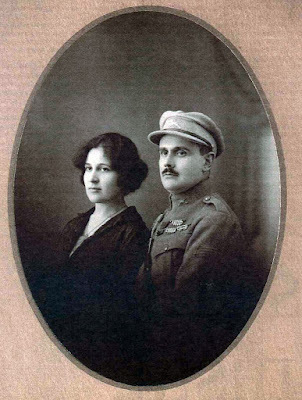 The present rabbi, Daniel Litvak, is from Argentina, and the vice-president, Isabel Ferreira Lopes, is a granddaughter of Captain Barros Basto.